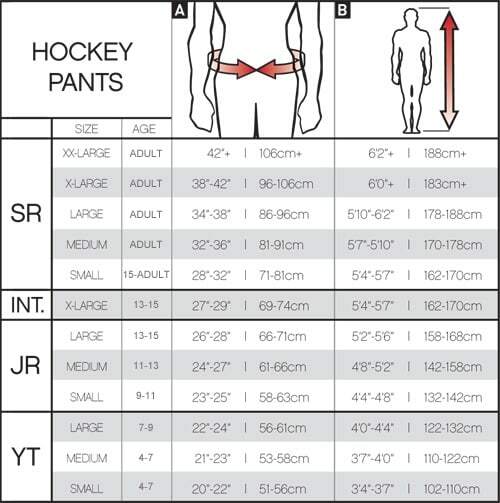 CCM Super Tacks Hockey Pants - Senior is rated 4.3 out of 5 by 4. The brand new CCM Super Tacks Player Pants are designed to meet the needs of the elite player. These anatomically fitting pants offer a great balance between protection and comfort. One feature that really stands out with these pants is how customizable they are. You can add a 1-inch extension to the length using the hidden length adjustment zipper. You can also adjust the spine protection in the back. These pants are constructed with Pro 400D nylon with side panel reinforcement which reduces the weight of the pant while maintaining durability. The Super Tacks pants are all about protection. The hip area has a JDP cap reinforced with D3O smart material which offers pro level protection of the hip while directing the force of impact away from the hip. Additionally, the kidney areas are protected by molded PE pro-level foam. The adjustable HD foam floating spine with D3O foam offers maximum customized protection in the lower back. The thigh guard comes with molded HD and PE foam offering pro-level protection to the thigh area. Overall, these pants offer the elite-level protection and features that you would expect from a pro pant with an added benefit of customization. You can hit the ice with confidence in the all new CCM Super Tacks Pants. Thigh Padding: Molded HD and PE foam Type of protection covering the thigh. Hip Padding: JDP cap with D30 Smart Material Type of protection covering the hips. Lower Back Padding: Adjustable floating spine with D30 Smart Material Type of protection covering the lower back. Waist: Padded belt system Type of waistband design. Rated 2 out of 5 by Steve11 from Poor quality, CCM doesn’t have high end service Quality hockey pants should last. Leagues are littered with high quality pants from years ago. Unless you have the budget to replace your gear often, skip these. Cheap zipper failed after a few men’s league uses. Just disintegrated. The padding spread as a result and I have a leg injury from the puck hitting my thigh in brand new, $200 pants. CCM didn’t answer the phone, didn’t stand behind their product. It took slightly longer than 90 days to fail because I only play 1x per week. There are a lot of good pants on the market, I have personal experience with other brands doing the right thing. Save your money on these and buy a different product. Rated 5 out of 5 by thugmoshgrind from great breezers lightweight and comfortable. ease of movement without restriction. These are the regular hockey pants/breezers. They are not a girdle.